Market-Share: Spread the anger around! If you had to name one successful viral campaign that had made an impression on you in the past 5 years. Which would be your favourite? For me, it definitely has to be the Subservient Chicken by our friends from BK. The campaign was launched in 2004 to promote its tendercrisp. And the simple idea produced astonishing results, entertaining millions around the globe. Especially the office workers who just wishes their boss will become that chicken in the video. 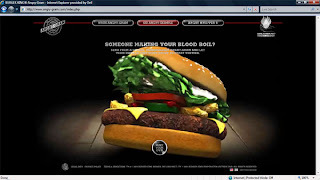 Burger King then launched a very successful "Whopper Sacrifice" in 2008, a campaign tapping on the power of networking on facebook. And the new member of their viral campaigns is the SEND AN ANGRY GRAM that has just been launched this year, to promote their Angry Whopper. This is a pretty fun campaign that allows you to send really angry words to your friends and whosoever. Playing with taboo almost always mean success (Refer to Mark Hughes's book, BuzzMarketing). And BK recognises that. Emarketer recently interviewed the man behind the success of these campaign, Jeff Benjamin. So here's Jeff sharing his thoughts on viral with you. Jeff Benjamin, Vice President and Executive Creative Director, Crispin Porter + Bogusky. Jeff Benjamin, the award-winning creator of online viral campaigns such as the “Subservient Chicken” and the recent “Whopper Sacrifice” for Burger King, spoke to eMarketer about how to think virally. eMarketer: The Crispin Porter + Bogusky employee handbook goes into the agency’s philosophy. One point is, “Keep money in context.” What does that mean? Jeff Benjamin: There are a lot of people wasting money on the online space, and then there are a lot of people using their money really effectively. We try and find spots where it’s not just about buying impressions—it’s about creating something that makes people create the impressions for you for free. People can do the advertising for you if you give them the inspiration and the tools. That was the case with the “Whopper Sacrifice” application [a recent campaign for Burger King]. We did do a little bit of a media buy on Facebook, but ultimately it was all about people putting it on their page and creating impressions and sacrificing friends. You’re getting more bang for your buck at the end of the day. eMarketer: What are some misconceptions about viral marketing? Jeff Benjamin: One big one is that in order to be provocative and get a lot of buzz, you can’t be true to your brand. I think a lot of brands make that mistake. They try to become something else just for the sake of being viral and making something sticky. You always have to make sure those things belong to your brand. Otherwise, I don’t think it’ll work and people won’t remember you for it. It won’t do anything to further the brand. People go into brainstorming viral, and you can’t go into it with that intention. What you can go into it with, though, is the idea of making a great ad. If you do make a great ad, people will talk about it. The viral part will sort of be a consequence. But a lot of times, clients will come to us like, “Hey, we want something viral.” That’s not very inspiring, because that doesn’t really give any insight into what the ad really is. Ultimately, we want to create great ads that are going to do great things for the client. If we do our job right, the consequence of that will be something that gets passed around and talked about. Even before the Internet, viral advertising always existed. It’s just changed its form. What’s been effective over the years keeps evolving. Like right now, I don’t think viral is creating something terribly subversive or anything. I think it’s about utility and tools that make our lives better or easier. Why are Maps drawn North to South? Is the internet giant treading on thin lines?